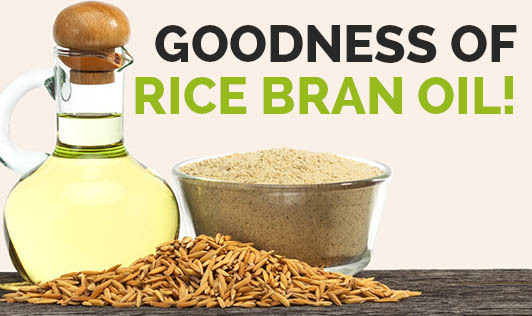 Goodness Of Rice Bran Oil! Rice bran oil is extracted from the germ and inner husk of rice. It has a high smoke point and a mild flavor which makes it ideal for cooking. Apart from this, it is also considered to be one of the healthiest oils for cooking. Let us look at some of the health benefits of rice bran oil. 1. It contains 47% monounsaturated fatty acids making it a heart-healthy oil. 2. It is known to increase HDL cholesterol (good cholesterol) levels thus improving blood cholesterol and overall health. 3. It is effective in relieving hot flashes and other symptoms of menopause. 4. It is rich in vitamin E, a natural antioxidant, which provides protection from cancer causing radicals. 5. It helps to strengthen immunity. 1. It is the ideal oil for cooking as it has a high smoke point and distinct flavor. 2. It can be used for baking as it gives a good texture. 3. Food cooked in this oil absorbs less of it making the food appealing and healthy. 4. It is good for salad dressing because of its flavor. 5. It has a good shelf life.